Adele is back making us all emotional again with her sensational third album, including hit single Hello, she’s also now trying her hand at some modelling. After a lengthy break following her last album, the 27-year-old wowed many upon her return after losing more than 12 kilograms. The London-born singer has previously indicated her hatred for going to the gym, but her new slim figure allows her to not only maintain stamina for her 2016 tour, but also allows her to feel good about herself. She previously featured on the front cover of Vogue in 2012 at the age of 24, and now she has returned following a strict diet and exercise programme, as well as a break from music to spend time with her family. Adele spent four years out of the spotlight, giving birth to son Angelo. But she has accepted that she missed the glamorous lifestyle and feared that she may struggle to replicate the success of her first album. She’s determined to allow her son to have a normal life outside of the celebrity spotlight, though that may not definitely be possible. But in the meantime, Adele will continue to surpass all of our expectations and excel in all fields that she tries her hand to, including modelling. She’s healthier than ever after giving up smoking in order to protect her voice and ensure she’s healthy for when her child grows up. She’s also found that she fits into a much lower size of clothes, which she says is an added bonus. 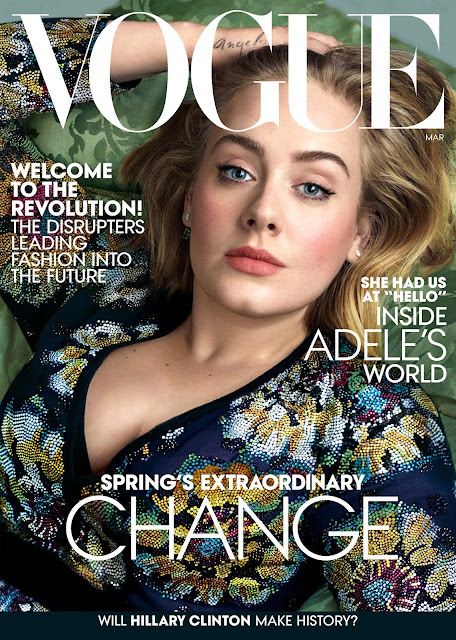 “Now I fit into normal, off-the-shelf clothes—which is a really big problem for me… I totally intend to share those dresses.” Adele appears in the latest edition of Vogue US in an in-depth interview about her career and future plans. It's due out this coming Tuesday. LUXE Models has a service for plus size models, so if you have what it takes to break into modelling regardless of your size or shape, register with us for free today.